Oscillatory Thoughts: Face processing in the brain: "That was a trip"
Face processing in the brain: "That was a trip"
There's a cool new (open access!) case study out in the Journal of Neuroscience by my friend and colleague Josef Parvizi. The paper, "Electrical Stimulation of Human Fusiform Face-Selective Regions Distorts Face Perception", is an analysis of a single subject, Ron Blackwell (he gave his name freely), an engineer from the Bay Area. Mr. Blackwell had experienced seizures since he was a teenager, but for decades his medication had staved them off. Slowly, however, the medication became less effective, at which point he agreed to undergo surgery to remove the epilepogenic tissue from his brain. As part of the pre-surgical mapping to determine where in his brain the pathological tissue was located, Dr. Parvizi and the surgical team implanted Mr. Blackwell's brain with passive recording electrodes. This technique, known as electrocorticography (ECoG), is an important aspect of my research. Dr. Parvizi and I have written and are writing several ECoG papers together. The nice thing about this technique is that it gives you the best of both worlds in terms of human brain imaging: knowledge of both where in the brain is active as well as when the brain is active. Normally, brain imaging is non-invasive, meaning we don't usually perform brain surgery and open up the skulls of our research participants! Surprising, right? Because of this there's always a trade-off between where and when. With functional magnetic resonance imaging (fMRI) I know down to the millimeter what parts of the brain are active--even the deepest regions of the brainstem. Sadly, however, we can only get a snapshot of this activity once every second or so. This is a fundamental limitation of both the technology and the signal we're measuring. ECoG doesn't suffer from these limitations because the signal is being recorded directly from the brain's surface. Of course, there is still a basic limitation here, and that is that ultimately these imaging techniques mostly only give us information about correlations between brain activity and behavior without being able to tell us about causal relationships. It's like if I have you running on a treadmill and record muscle activity from your arms. When I make the treadmill move faster, you run faster and your arms move faster! The correlation between your movement and the treadmill speed is so strong, in fact, that it can't be due to chance. "Aha!" I exclaim, pleased with my experimental cleverness, "look at that correlation! The arms must be critical for running." Of course, all it takes is one person who is missing an arm to run on that treadmill to disprove my hypothesis. As I've said many times before, this is why working with people with brain lesions is so important to neuroscience and why I work with such patients. If a person who has a lesion to a brain region thought to be responsible for an emotion or behavior of interest can still experience that emotion or do that behavior then that is not where that behavior is located in the brain, regardless of how many imaging studies show activity in that region. Of course, we can't go around lesioning peoples' brains! So how else can we get at causality? Imagine the treadmill scenario again. This time I can shock your arms while you're running. So I shock the muscles, and they twitch, and you shoot me a nasty look, but you don't really break your stride. "Huh," I think, "but the correlation between the arm muscle activity and running is so strong... but if I disrupt his arm muscles he doesn't stop running. Strange." So I begin recording leg activity. And again I see a huge correlation. But I'm cautious about making any strong claims yet. This time, I'm smarter, and I hook your legs up to my electrical stimulator and set you running on the treadmill. This time when I send that shock, your quads spasm and you collapse. Eureka! A triumph for science! The legs are where running happens. As I sitting at home, nursing the black eye you gave me once your leg stopped spasming, I pride myself on a job well-done. This analogy (minus the black eye, I believe) is what Parvizi's paper added to our understanding of how and where the brain processes faces. 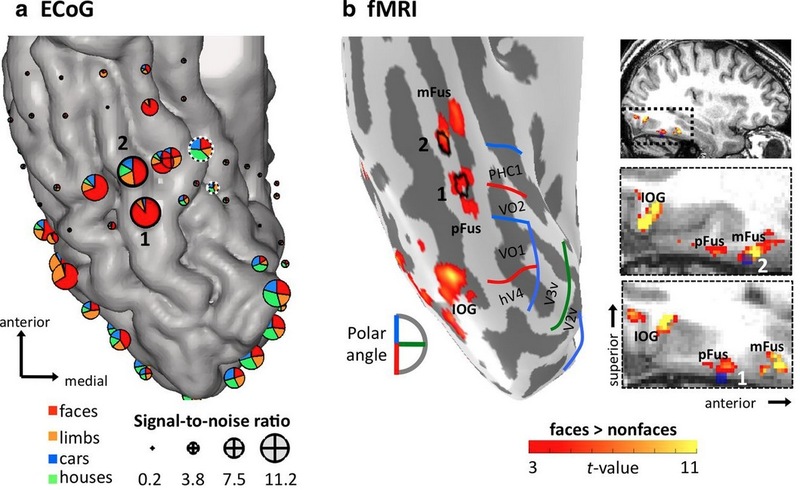 Parvizi and his group took advantage of a fortuitous situation wherein an fMRI scan of Mr. Blackwell showed clear differences between face and non-face processing activity in the same regions where they happened to have the ECoG recording electrodes implanted. 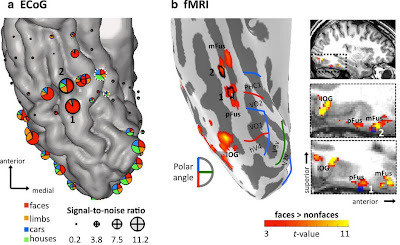 This allowed them to look at face processing in Mr. Blackwell's brain in both fMRI and ECoG. Furthermore, they also had a stimulating electrode there. And check out the video below to see what happened to Mr. Blackwell's face perceptions when he was stimulated. I really respect this paper because of its combination of methods to converge on correlational and causal links between brain and behavior, which are often sorely lacking in cognitive neuroscience. Great post! The video link appears to be broken, however. I'd really like to see it. It should be corrected now! Video games give kids dementia?